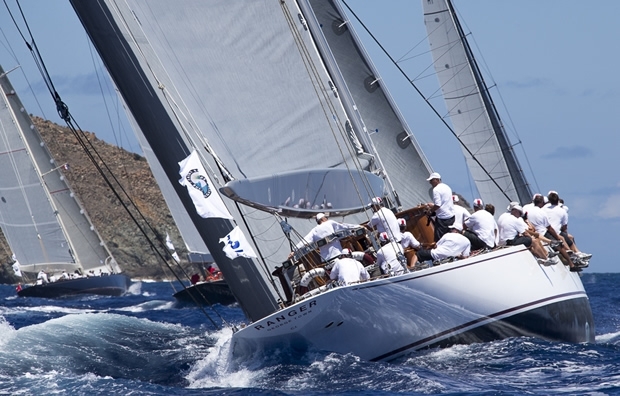 Hundreds of superyacht owners, crews and industry leaders have chosen to spend their long Easter Weekend at the St Barths Bucket, where pursuit-style racing of absolutely drop-dead gorgeous mega sailing yachts has become an annual affair since 1995. Racing started today for 31 entries in three classes (for fast 'Gazelles', sleek 'Mademoiselles' and highly revered 'Grand Dames', while it was the second day of racing for the five Js. Parsifal III, in the Les Grandes Dames des Mers class, turned in one of the closest finishes of the race today, getting the horn for fourth place after overtaking Silencio on the reach to the finish line and edging them out by a mere 17 seconds. "The energy increases when you see you have the chance at winning," said Parsifal III's owner Kim Vibe-Petersen. "Every one of us, until the last 20 minutes, didn't think we could overtake Silencio. But something special happened in the wind...bing, bing, bell! And we took off." Tactician James Lynne explained that once Parsifal III was within 80m of Silencio, she got into a lull and bore away to keep the separation. "We were very lucky and got a nice gust; we had the whole crew (46 in all) hiking out to windward," said Lynne. The Alloy Yachts ketch Blue Too won the Les Grandes Dames des Mers class, employing a winning strategy based on the KISS (Keep it Simple Stupid) theory. "We just went for a yacht race," said tactician Chris Bouzaid. "We had great crew and a great yacht. In this light air the hardest thing is keeping these big boats moving. We managed to keep the boat moving and that paid off." Captain James Barrett added that the best call today was to stay away from the land. He said Blue Too's owner thoroughly enjoyed steering for the entire race, which was 17 miles counter-clockwise around the island. "The yacht has one of the smaller crews in this regatta - five permanent and 11 for racing," said Barrett, adding that Blue Too finished third overall and second in class last year. Joining Blue Too's crew today was John Winder, a member of the International Super Yacht Rule (ISYR) Management Team who is here working Jim Teeters, the head of it. "What was really fun was that Ron Holland was aboard and he and Chris Bouzaid were doing a lot of talking and reminiscing, refreshing one's memory from the way-back machine," said Winder. Winder went on to explain that the ISYR management team has been expanded so it can get more eyes and ears on the race course with the superyacht teams. "If you think about it, we started years ago with just the Bucket and the Superyacht Cup Palma, and now we're up to over 10 events. We are working with skippers and tacticians to answer their questions and deal with their concerns in an on-going dialogue," said Winder. To that point, the Super Yacht Racing Association, to which many boat owners here belong, held its annual meeting here on Wednesday. At the heart of discussions was the ongoing work toward making superyacht racing safer. Each yacht entered here has been issued a Pantaenius Nikon Laser Rangefinder, made possible by Bucket sponsor Pantaenius yacht insurance. The range finders are required under an appendix in the Racing Rules of Sailing for all SYRA sanctioned superyacht regattas and are for use by each yacht's Safety Officer to assure that a minimum of 40m separation between yachts is maintained at all times. The five J Boats that were fleet racing today corrected out to finish in the same order that they crossed the finish line. Hanuman took the top slot on the scoreboard, and it was significant that only eight seconds separated the second-place finisher Lionheart and the third-place finisher Velsheda. Tomorrow's 'Not So Wiggley Course' will take the fleet around out-islands to the northwest of St Barths. Tonight, after daily awards are presented, the race will be to the much-anticipated dock party and fleet open house.